In the summer of 2015 part of the Robot Envy crew, Amy Reyes and myself (Dave Pasciuto) had the honor of visiting Satelight Studios— Producers of Macross, and recent shows (Macross Zero, Macross Frontier, Macross Delta), Aquarion and several other major anime stories in Japan. The Creative Director of the studio is Shoji Kawamori, one of the most renowned mechs-designers worldwide. We were fortunate enough to spend some time with Stanlias Brunet, Thomas Romain and –two French designers working full-time at Satelight, and Kiyomi Fukuyama our International Sales director. We asked them about their experiences working at the studio and their relationship with Shoji Kawamori. Dave Pasciuto: How is it working with Mr. Kawamori? Stanislas Brunet: Mr. Kawamori recently has been slowly stepping back in the mechanical design. I mean, he is still working on lots of design, but the more the times goes by, the more he focuses on global concepts and ideas rough designs. He trusts other designers to take the work from there. This way he can spend time to develop original series concepts, screenplays and innovative projects beyond animation (live stages, VR projects, etc). He also likes to travel a lot, and is often invited to speak at events in Japan or overseas. Thomas Romain: I’ve never seen a person so motivated. He is always developing new mecha design, ideas and series concepts. He never sleeps! Most of the time he's busy creating new animated TV series, which is our main goal at the studio. He usually creates the original story concept, such as for Macross or Aquarion. He also writes a lot, and draws massive amounts of storyboards, but he requires support by assistants and other directors. Making television series is very difficult, it’s never a one-man job. Dave Pasciuto: Difficult in what ways? Thomas Romain: ...in terms of the physical amount of work. In general, It is usually very hard and time consuming to produce animation, but in Japan it is even more challenging. The animation we produce at Satelight is aimed at anime fans who demand a very high-quality. It’s not simple kids shows. A ton of effort goes into the small details when we are designing environnements, robot designs, and character costumes. Besides, production budget aren’t very high compared to the US standards for example, and the schedules are extremely short. Japanese directors, animation teams, and the entire staff have to work a lot and work very efficiently to finish the episodes on time. Dave Pasciuto: Stanislas, I heard that Sensei Kawamoriwas a mentor for you. Stanislas Brunet: Actually, I was designing mecha before meeting him. For example, I created all the spaceships of the French-Japanese SF anime; Oban Star-racers when I was just 26 year old. Thanks to Kawamori’s advice, I improved quite a bit technically. When I first started at Satelight, I was working on secondary designs, but now he is handing me the important designs as well. Dave Pasciuto: Wow, that's awesome! Stanislas Brunet: Recently, I was in charge of the main robot designs of the third series of Aquarion (Aquarion Logos), which is one of the original IP’s we have at Satelight. This is a great career opportunity for me. Before that, I was in charge of the mecha designs of the bad guys on previous series (Aquarion Evol, AKB 0048,...). I think this was the first time Kawamori-san is handing over the main mecha design of a show he created. Thomas Romain: Yes, this shows that Kawamori really trusts Stan, but Stan’s designs are outstanding, so this is pretty natural to me. 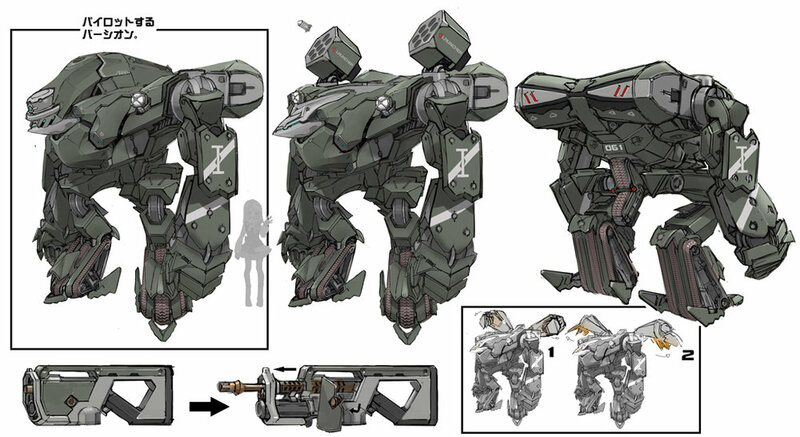 Stan is one of the few mecha designers in Japan who can conceptualize transformation gimmicks. All the parts of the machine have to rotate, change positions, and fit perfectly, whether they form the robot form, or the vehicle form. This is a very tricky job. Stan is very good at that, and Kawamori knows it. Besides, Stan is good at finding new shapes. He has a very unique approach. He don’t use regular mecha patterns, like the ones which are used in shows like Gundam. Stan’s design really stand out in my opinion. Stanislas Brunet: Thanks, but there is another reason why Kawamori let me handle the main mecha designs of Aquarion Logos, at that time he was already very busy designing the new Valkyrie models for Macross Delta, and the producers wanted him to focus on that task. Dave Pasciuto: How long have you guys been working here? Stanislas Brunet: It’s been a pretty long time. We both started working for Satelight in 2006. Dave Pasciuto: Very cool. So what does Satelight create here? Is it a design studio? Kiyomi Fukuyama: Not really. Satelight is an animation production company. We mainly produce animation series for television. Sometimes we are working from existing material like mangas or light novels to create an anime adapation for TV, but we also create lots of original IP’s thanks to Kawamori’s aura and creativity. Not all Japanese studios are in position to create original animation as fast as we can. Thomas Romain: Yes this is our main job, but we are also working for different types of clients. Sometimes we create animation for video games, or because we have a strong in-house design team, we can also create designs for movies, games and the toy industry. I think this is what makes us different. We are not a regular animation studio. I am also very proud of our “French team”, a core of 5 French designers I have built. Some of us are working on several projects at a time as background or mecha designers. We mix our team with with freelance Japanese designers as well, so we can cover all the design needs for the shows Satelight is producing. Dave Pasciuto: Awesome! Sugoi! - one of the few words I've learned here. How many teams are here then? How many people work here? Stanislas Brunet: Difficult to say because in Japan, most of the staff is working are freelance - designers, animators, background artists, etc. A few hundreds people are working on all of our shows. And we are producing around 4 or 5 shows each year. So basically more than 1000 people are working for us, but at Satelight, we only have around 100 employees. The other people are freelancers, or working for smaller subcontractors. There are hundreds of animation related companies in Tokyo! Thomas Romain: Most of our employees are producers, managers, and people working in business department and accounting department. We only have maybe around 15 and 20 creators–people who can design, direct, write or animate. Kawamori San, Stan, a few others and myself are the creative soul of the company. Dave Pasciuto: Wow? This is very surprising. Is that common? Thomas Romain: Yeah, very common.This may sound crazy, but this is how studios in Japan work. Most of the creative staff are freelancers who go back and forth, picking up interesting projects wherever they are. Which is a real nightmare for the managing producers! Each time a new project is starting they have to gather the staff. The industry is currently suffering from an overproduction crisis, they are really struggling to build and organize the teams. The good thing is that there are plenty of job opportunities, for foreigners like us as well. Stanislas Brunet: It's the work of the series director and episode directors. Directors are checking all the creative material (designs, storyboards, animations, backgrounds), everything. They act as artistic directors as well. They meet with all the team leads and share their vision, give instructions, make notes. They really do a ton of meetings. Thomas Romain: And they draw a lot too! Most of the directors are drawing storyboards, and while they cannot draw all the storyboards for an entire show by themselves, they carefully check artists work by redrawing scenes and adding notes. Kawamori is always storyboarding lots of scenes by himself in the anime he is directing. Kiyomi Fukuyama: That's a big job. Stanislas Brunet: Sometimes it can be difficult to keep a visual consistency difficult because you're working with freelancers who are not working in the same place near you. Some people are working only one or two days per week in the studio, some are working home, others have their desks in different companies. Some people even have several desks in several studios at the same time! So organizing regular meetings is the key. Dave Pasciuto: So animators work at home and send stuff in? Thomas Romain: Yes, or like I said, sometimes they have a desk in other studio even while they are working for us. We have also in-house animators working at Satelight but for other companies projects too. The entire Japanese animation industry is mostly concentrated in 2 Tokyo wards, Suginami and Nerima. Most of the studios and animators are here, create a very dense and complex network. There is a subtle balance of competition and mutual aid between the studios. This is very unique. Thomas Romain: Most of the staff is not working in our walls. People can be everywhere. The production assistants are spending a lot of time going one place to another to get the drawings and bring them to the directors, sending email, calling animators to check the progression of their work, etc. Dave Pasciuto: It's like that in the States too; the animators are mostly freelancing. They come to the studio and are hired on for that project for a certain amount of time as well. Stanislas Brunet: Also, a lot of freelance animators are working on several projects at the same time, some of them are only working part-time for us, or on certain episodes only. The rest of the time they are working for other companies. Dave Pasciuto: That's crazy! Hah! Stanislas Brunet: Every designer or animator we hire is unique. Everybody has their own style and skill-sets. People are not always interchangeable. Production assistants have to deal with each artist’s availability. Managing the team is very complex. Dave Pasciuto: Sounds like it! Stanislas Brunet: But almost all the animation studios are located in this area. So everybody's more or less in the same place. Even if we are not working in the same building, people are at least in the same neighborhood. 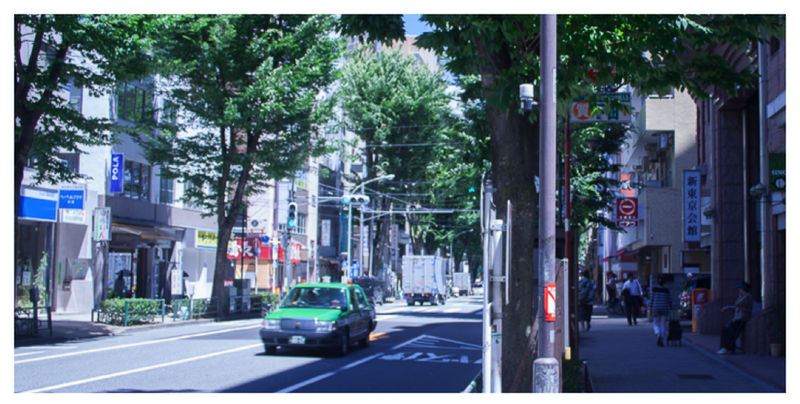 Thomas Romain:: I consider this part of Tokyo as the center of the animation world. There is no other place in the world with such a concentration of animators and artists. Japan is the country which produces the most animated shows and it’s all made here. sometimes with the help of asian subcontractors, but it is for the less creative tasks. Most of the animators are Japanese though, which is crazy because local traditional animation has almost completely vanished from the other big animation countries, USA and France. Japan is the only developed country that is able to keep their animators at home, but this comes with lots of sacrifices. Stanislas Brunet: So when you're walking on the street in this area, sometimes you see production assistants holding animation materials. Stanislas Brunet: Not cels, because celluloids are not used anymore since the end of the nineties. All the studios switched to a digital painting process. But the animation drawings, the lines, are still drawn on paper, then scanned before colorization. Thomas Romain: This may sounds crazy, once again, but while all the traditional animation is now done with digital animation softwares like TVPaint or Toonboom. Everywhere else in the world, most of the Japanese animators are still working on paper. Some people are use to draw on paper from decades, you cannot force them to leave their beloved pencils and paper for a computer. Besides, buying a computer, a tablet and a software license would be too expensive considering the low budgets. And as most of the animators are freelancers working somewhere else, the studios cannot provide computer and material for them to use. There are some experimentations though. It will slowly evolve during in the next few years. Dave Pasciuto: That's interesting. How about the backgrounds, are those digital paint? Stanislas Brunet: The backgrounds are mostly done digitally now, but there are still artists who work with traditional paintings and brushes. Kiyomi Fukuyama: That's one thing we've noticed in Japan, is paper is very much alive and well. In the States, they say paper's dead and everybody works digitally, and it's more rare to find people working traditionally. Stanislas Brunet: We can go upstairs later, we can show you where where we are working and look at a few drawings. Dave Pasciuto: That would be amazing! Dave Pasciuto: I never thought I would be able to come to Satelight and meet you. Who would think that? I'm just some guy in America [chuckles]. Thomas Romain: You’re not just a random guy you are a designer yourself and you have built a solid community of people loving robot designs and illustrations. The Robot Envy website and artbooks are awesome, very inspiring! Dave Pasciuto: I mean Kawamori and you guys design the most iconic mecha on the planet. You know what I'm saying? Thomas Romain: That’s true for Kawamori San since the eighties. But us, we are just working on a few anime which are pretty niche after all. Dave Pasciuto: What are your hours like here? How long do you work? Thomas Romain: Usually around 8 or 9 hours per day. But in a rush time, it can be more. 12 hours, even more, depending of the situation. Dave Pasciuto: Stay and crunch. We call that crunch time [laughter]. Kiyomi Fukuyama: We call Thomas, Stan and the other French designers the “French Team” [laughter]. Unlike most of the Japanese artists, they come early in the morning and do not stay very late. Thomas Romain: Well, actually it depends on the project. Recently, I’ve been working almost everyday until midnight because I have more responsibilities toward the project and I’m very passionate about it. I also work on Saturdays. I couldn’t be working so much in France. They are some restrictions. The studios are closing during the night and the week-ends. In Japan, it’s open 24/7. If you like, you could be working all the time, staying every nights at the studio. I mean, some Japanese animators do that. But it’s not healthy. It’s important to find a good balance between work and free time. This is a problem this industry has to face. Amy Reyes: We've been amazed here just seeing people coming home from work or still dressed in school clothes, and it's 10:00 at night. Stanislas Brunet: Japanese are hard workers. There's always thousands of people on the train, no matter what time of day it is [laughter]. Dave Pasciuto: We were just marvelling at that, because we think about back home, in Chicago, a Sunday evening downtown, there's not much going on. It's going to be pretty quiet. Here, it looks the same as it does [laughter] normally during rush hour. That's been just pretty incredible to see. We arrived at rush hour in Shinjuku Station with our luggage. It was like, "Oh, this was bad timing." Stanislas Brunet: Yes you should have chosen a different time to arrive. haha. Dave Pasciuto: Haha. Yeah I know. Yeah, we were definitely the Americans. But anyway, thank you for this very insightful chat about the work at Satelight, and the how the Japanese anime industry works. We learned a lot, this was an incredible experience! Thomas Romain, Stanislas Brunet, Kiyomi Fukuyama: You’re welcome! A very special thank you to Kiyomi Fukuyama, Stanislas Brunet, Thomas Romain and Shoji Kawamori for making this happen, and for their wonderful hospitality. It was truly a special experience. We will return soon! Until then, check out Thomas Romain's art book, Lost in Anime! Order your copy at CDJapan!